Peel the skin of beetroot and boil them in lightly salted water. When done let them cool down and cut into small bite sized pieces and keep aside. Place a saute pan on medium flame, add some oil to it and add chana dal, red chillies, jeera, mustard seeds and let the seed splutter. 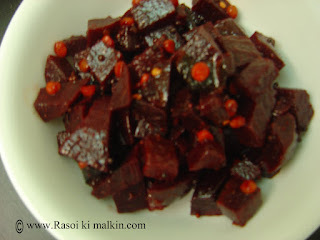 Add the beet root pieces to the pan, add salt (if necessary) and add red chilli powder and stir them. You can add little grated coconut just before you switch off the heat. This is optional. Coconut adds a lot of flavor and authentic south Indian flare to it.